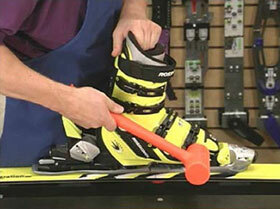 The Calibrater is designed to measure the release torque of Alpine ski/boot/binding systems. Three components are necessary to conduct all tests: a FOOT, a LEG, and an ARM. The FOOT is a last, which is inserted into the boot. The LEG is an extension of the FOOT used for forward or backward lean tests. The ARM is a torque wrench, which is attached to the FOOT for twist release tests and to the LEG for forward or backward lean tests. The VRC-XX8c includes a LEG, Adult and Junior FOOT, Universal ARM, Tilt Vise with Mounting Hardware, Tool Hanger with Calibration Bracket, Torque Limiting Screwdriver with adapters, Short Ski Adapter, AT Adapter, Dead Hammer, Post-Accident Inspection Forms, Benchtop Reference Guide, Parts Kit #1 (including Replacement Release Indicators & Heel Strap, Elastic Stabilizer Shunt, Foot Collar, and Instruction Manual & DVD), and a foam-lined storage box. To perform a twist release test, the FOOT and Foot Collar are placed in the boot, the ARM is attached to the FOOT, grasped with a hand at each end, and rotated to release the binding. The release torque is read from the twist scale of the ARM. 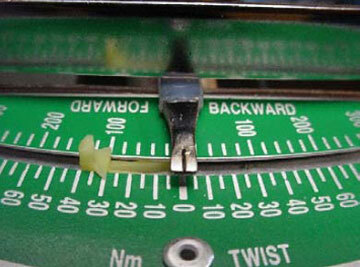 Separate release torque indicators are provided for clockwise and counter- clockwise measurements. To perform a forward or backward lean release test, the LEG is attached to the FOOT, the strap is placed under the boot heel, the ARM is then attached to the LEG, grasped with one hand and pulled to release the binding. The release torque is read from the forward lean scale of the ARM. The Tilt Vise supports the ski for twist tests and tilts to secure the ski at a convenient angle for forward lean tests. 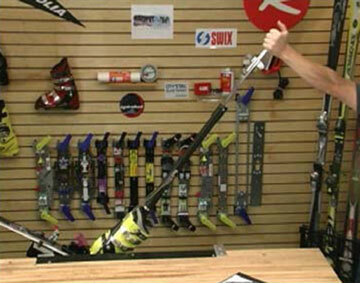 The vise can also be used to hold the ski during binding installation and repairs. A chip tray catches debris and automatically deposits it into a detachable plastic bag whenever the vise is tilted. The vise is now wide enough for fat and carving skis, and long enough for most all templates. Ski clamp pressure is adjusted with knobs located under the vise. A new adjustable center support is now included to preserve ski camber for systems with performance enhancement features. If the ski is too short for the Tilt Vise, the Short Ski Adapter is slipped over the tail of the ski and the box tube frame of the Vise. The Adapter is then clamped in place as if it were a ski. 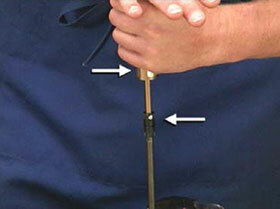 Use the Dead Hammer in place of the palm of your hand to test the binding toe piece for correct anti-shock performance. Be careful not to strike buckles or other boot fixtures. The Torque Limiting Screwdriver (TLS) is preset at the factory to approximately 4 Newton meters (Nm) torque and is marked with a red cap. Units set to 3 Nm are marked with a black cap. When the TLS clutch releases, it is an indication to the mechanic that the preset torque has been reached. The Torque Limiting Screwdriver can also be used to check the preset torque of power screwdrivers. Parts Kit #2. Includes (3) Clamp Bumpers & Hardware, Assorted Vise Pads, and (4) Ski Stops.